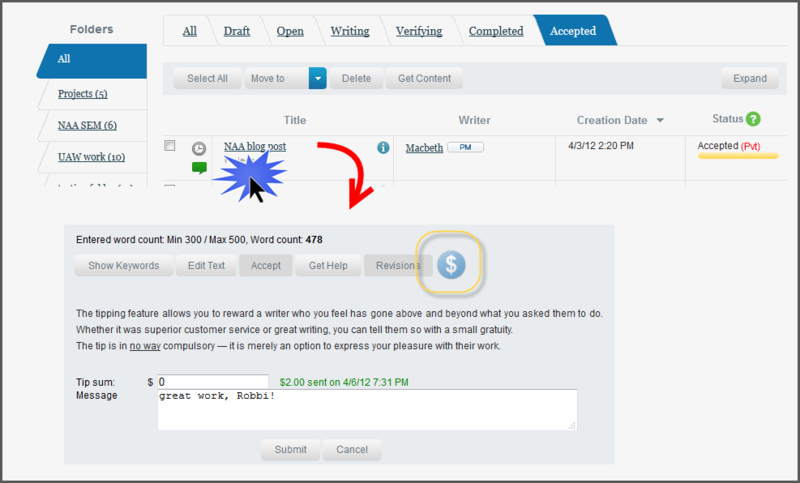 Use the tip or gratuity feature to send a tip to your writer for work well done. Here's how! Click the title of any finished request (doesn't matter if it is accepted or in the completed status) and find the blue dollar sign icon. Click it. Send a tip - that's all there is to it. The system will send any amount to your writer that you want directly deducting it from your credit balance. Q. Is there a specific amount I should send? A. No. There is no standard or percentage that is required or desired. This feature is completely optional and is not compulsory in any way.